What has world trade got to do with demand behaviour of marine paints and coatings? asks Kunal Bose. A lot, since it boils down to at what rates ships for dry bulk and liquid cargoes and containers will be hired. This, in turn, has a decisive bearing on shipping capacity available at a given point and orders for new vessels placed with shipyards in different countries. With daily charter rates for Capesize vessels down from a peak of over $100,00 per day in 2008 to less than $10,000 now, shipping companies hardly able to recover costs, including servicing of mountains of debts have expectedly become highly circumspect in placing new orders for vessels. Two consumption points of marine paints are shipyards and ship repairing dockyards, both getting more and more concentrated in Asia, particularly in China and South Korea. It’s no music to the ears of marine paints manufacturers that Adam Slater, economist at Oxford Economics is forecasting that world trade will “expand by just 2.6% this year, down from 4% in 2014 and by only around half of its long-term average pace. Indeed, the projected pace of world trade growth looks more akin to that seen in world recessions than periods of recovery.” Slowdown in world trade growth will be largely on account of China, which has started losing its voracious appetite for commodities as its manufacturing imports have started to come off a cliff. In the meantime, a Goldman Sachs report says a sharp deceleration in dry bulk trade in a situation of shipping market oversupplied with vessels will continue to put downward pressure on the dry bulk freight market at least until 2020. Goldman report says “the size of the fleet [Capesize and Panamax vessels] doubled between 2008 and 2015, and the current order books will ensure that shipping capacity continues to grow until 2017, when vessel retirements will finally outweigh new deliveries.” Such rapid growth in shipping tonnage in turn spelt good times for marine coatings and paints manufacturers. The prospect marine paints manufacturers dread the most is fall in order for new ships. Their margins sufficiently squeezed, ship owners are also prone to postponing vessel repairing and maintenance work without of course breaching safety regulations. And all this is what exactly is happening. Despite the travails of shipbuilding enterprises in all continents and mounting pressure on them to offer discounts in order to secure new vessel orders, a new research report says the global marine coatings market at $7.65bn in 2013 will expand at a compound annual growth rate (CAGR) of 6.5 between 2014 and 2020 to reach $11.88bn. Since a tiny section of the world population will ever indulge in extreme luxuries irrespective of how well or badly the economy fares, leisure boats or yachts tending to be bigger and bigger in size are “projected to be one of the fastest growing applications for marine coatings and paints during the forecast period,” says the report. Ships plying coastal routes have remained the largest application segment for coatings and paints over the past few years. Coastal shipping found to be cost effective in an environment friendly way by many countries with long coastline like India is seeing steady expansion. India has a coastline of 7,517km. east Asia too, is the key factor for “growth of marine coatings industry in Asia Pacific.” Based on ships gross tonnage completion in 2014, China (22.682mt [million tonnes]) topped the list followed by South Korea (22.455mt), Japan (13.421mt), the Philippines (18.78mt) and Taiwan (600,000 tonnes). Germany comes next with completed tonnage of 519,000. A fall in new ship orders in the last few years impacted sales of marine coatings and paints. But this was compensated to some extent by growth in offshore sales. This became possible as major shipyards in South Korea and China instead of idling capacity and manpower started focussing on offshore structure construction like drill ships, jack- up rigs, semi-submersible rigs, and floating production, storage and offloading units and offshore platforms. commissioning in the third quarter of 2016. Similarly, the company is expanding its manufacturing footprint in Indonesia, Singapore and Australia. For most paints MNCs, business in Asia has experienced double digit growth in last five years. “In future too when the world leaves behind economic uncertainties a legacy of crippling global recession of 2008 and order books of shipyards become fuller, the Asia Pacific region will deliver the most in terms of demand growth of marine coatings and paints,” says the official. The die has been cast as to how industry leaders will manage their business in future. While research and development work focussing on making marine paints more and more environment friendly and also allowing ships to move faster at lower fuel consumption will be done at centres in Europe, the US and Japan, MNCs remain committed to expanding production base in places where shipbuilding and repairing operations are concentrated. During his recent visit to Japan and South Korea, Indian prime minister Narendra Modi said he wanted shipbuilding to become an important strand of the ‘Make in India’ campaign. Similarly,Vietnam remains committed to expanding its shipbuilding industry. No wonder, both India and Vietnam figure prominently in market development strategies of paints leaders. This statement rings true across all shipping markets where eco efficient vessels are becoming more marketable on the back of reduced bunker bills and emissions output, increasing their competitiveness in the eyes of the charterers. However for the dry bulk sector this combination of savings could be fundamental to the market’s survival; with some analysts predicting that freight rates will not reach breakeven levels until 2017. Therefore ship owners who are unable to implement strategies that drive greater efficiency, risk not only a dip in profitability but also business continuity in worse-case scenarios. These far-reaching consequences mean the dry bulk sector is united with other areas of the shipping market that are turning to eco efficiency technologies to drive greater operational and environmental efficiency. And the inherent need for all vessels to be protected is one of the key reasons many ship owners and operators prioritize hull coatings as their clean technology of choice. Indeed many industry leaders are choosing advanced biocide-free foul release coatings such as Intersleek1100SR®, the latest product in the Intersleek® range offered by AkzoNobel’s Marine Coatings brand, International®. Intersleek® technology has been proven to increase a vessel’s efficiency and reduce CO2 emissions and associated fuel costs by an average of 9%. Intersleek1100SR® is the coatings industry’s first biocide free, fluoropolymer technology that tackles the market’s age-old “slime challenge”. Slime is a complex, varied and dynamic organism that begins to colonize surfaces as soon as they enter the water, and has been proven to have an adverse effect on the efficiency of all vessel types. Indeed, every year it can cost the shipping industry 44 million extra tonnes of bunker fuel and an extra 134 million tonnes of CO2 emissions. In addition to Intersleek1100SR®’s slime busting capabilities, from a wider environmental perspective the coating has higher volume solids and lower applied film thicknesses than other fouling control systems. This typically results in a 40% reduction in paint volume and 60% reduction in VOC emissions for first time application.At future dockings it can reduce paint usage by around 75%,VOC emissions by over 80% and waste packaging by over 60%. The benefits of Intersleek®1100SR in reducing fuel consumption and associated emissions can also create additional bottom line benefits for dry bulk ship owners and operators who enrol their vessels into International®’s carbon credits scheme. This is the first methodology of its kind developed for the shipping industry in conjunction with The Gold Standard Foundation, which enables users to reap additional financial benefits on top of the operational, environmental and energy efficiencies achieved using Intersleek® by claiming carbon credits based on the CO2 savings that are generated. Based on the 100 eligible ships already converted from a biocidal antifouling to Intersleek®, there is an estimated total of $2.8m worth of carbon credits potentially available to ship owners and operators. 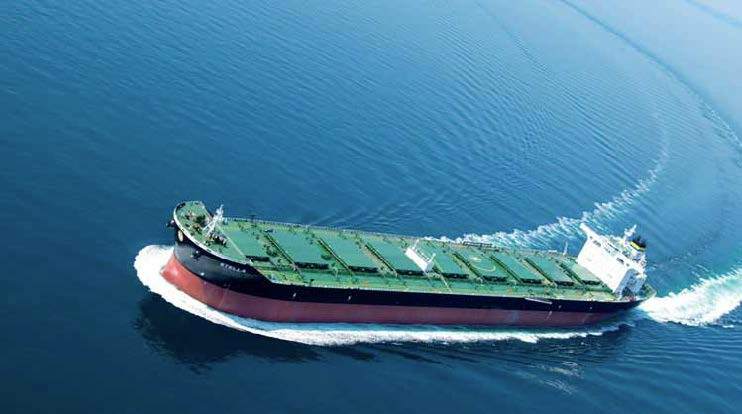 The first carbon credits claims, worth a combined total of almost $500,000, will be imminently awarded to two ship owners that enrolled 17 vessels into the programme. While hull coatings are the most widely used eco efficiency technology in the shipping industry there are still barriers that are preventing the widespread uptake of clean technologies in general. One of the core challenges to be addressed is the understandable requirement from ship owners and operators to see a tangible rate of return on investment prior to the installation of hull coatings or indeed any other eco efficiency technology. International® recognizes this and is working to address the issue through its latest research into a new methodology that assesses the impact of hull roughness on a vessel’s efficiency both at dry dock and after a coating application, as well as during the subsequent dry docking cycle. The research builds on the landmark work of Dr Bob Townsin, the first researcher and academic to establish the important link between hull roughness and ship powering in the 1980s. While Townsin’s methodology is upheld by the shipping industry today, trends in hull coatings, ship yard practices, environmental changes and regulations, as well as vessel design and operation have altered considerably over the past 30 years. Consequently, International® aims through its research to develop an updated model that accurately reflects the changing dynamics of the shipping industry. In the wake of depressed freight rates and an uncertain future largely dependent on dwindling coal and iron ore trade in China, the dry bulk sector is rightly targeting more efficient operations in order to maintain healthy profit margins. By converting vessels from a biocidal antifouling to International®’s Intersleek® range, dry bulk ship owners and operators can fulfill the inherent requirement to coat their vessels while benefiting from fuel savings and reduced CO2 emissions that can be converted into carbon credits to boost income further. However, before adoption of eco efficiency technologies can become widespread, ship owners and operators must first be satisfied that in exchange for their investment, the benefits promised to them by technology providers can be delivered. This is particularly important in the dry bulk sector that operates within razor thin margins and must spend every dollar wisely. There is still work to be done by technology providers to build the proof and trust that the dry bulk sector rightly demands before investing in eco efficiency technologies. Developments such as the carbon credits scheme, which financially rewards investment, as well as International®’s average hull roughness methodology offer an important tool through which greater confidence can be fostered, driving further update and supporting the long term sustainability and financial stability of the dry bulk sector. Baggermaatschappij Boskalis B.V. (Boskalis) is a leading global maritime services company operating in the dredging, offshore energy and inland infrastructure sectors, writes Sijmen Visser, Global Marketing Manager Marine, PPG Protective and Marine Coatings. The organization operates in over 75 countries across six continents, with a versatile fleet of over 1,100 vessels and equipment. Boskalis is active in the energy, ports and infrastructure markets, with a wide range of clients including oil companies, port operators, governments, shipping companies, international project developers, insurance companies, and mining companies. The Causeway, the company’s new hopper dredger handles large amounts of highly abrasive, heavy materials. The challenge was to find a coating that would withstand the persistent abrasion to the steel surfaces due to the constant loading and discharging of sand and stones. Following two years of extensive testing, PPG Protective & Marine Coatings (PPG) worked with Boskalis to provide the SIGMASHIELD System. PPG applied a system comprising the SIGMASHIELD 1090 product as an under layer with the SIGMASHIELD 1200 coating as a finish layer on top to the Causeway at the Shipyard Boer, Sliedrecht,The Netherlands. The SIGMASHIELD 1090 product is a two-component, solvent-free polyamine-cured epoxy compound. After blasting the total area, one layer of SIGMASHIELD 1090 was applied. Following this, to obtain a very smooth surface, the SIGMASHIELD 1200 coating was applied on top of the SIGMASHIELD 1090 product. The SIGMASHIELD 1200 product is a two-component, abrasion-resistant, solvent-free, phenolic epoxy coating that gives the system additional abrasion- and impact resistance. As a result of its smooth finished surface, the sand and mud will discharge faster and therefore less cargo will remain in the hopper. The combination of the SIGMASHIELD 1090 and SIGMASHIELD 1200 coatings produces a hard-wearing, smooth surface ideally suited to areas that are subject to heavy impact and abrasion from a variety of damaging cargoes. The key benefit for the owner on this vessel is that abrasion of the steel will be reduced and the steel thickness will therefore remain intact for a prolonged period, which is a significant financial benefit as steel renewal is a costly investment for the owner. suitable for decks exposed to heavy impact and abrasion. Outstanding protection of the steel due to the excellent resistance against abrasion and impact. Following the success of the project, Boskalis awarded PPG the task of applying the same coating system for the Strandway, a further hopper dredger. PPG will monitor this vessel with the owner to record and quantify the long-term benefits and cost reduction resulting from the application of the SIGMASHIELD products. PPG Industries’ vision is to be the world’s leading coatings company by consistently delivering high-quality, innovative and sustainable solutions that customers trust to protect and beautify their products and surroundings. Through leadership in innovation, sustainability and colour, PPG provides added value to customers in construction, consumer products, industrial and transportation markets and aftermarkets to enhance more surfaces in more ways than does any other company. Founded in 1883, PPG has global headquarters in Pittsburgh and operates in nearly 70 countries around the world. Reported net sales in 2014 were $15.4 billion. PPG shares are traded on the New York Stock Exchange. Maintaining its strong position in the market, in March this year the world-wide coatings manufacturer Hempel launched HEMPADUR QUATTRO XO — a high- performance range of pure epoxy PSPC-compliant coatings for marine new- buildings. Although specifically developed for ballast water tanks in new vessels, the new coating can also be used as a uni-primer for most vessel areas — above and below the waterline — providing high- quality performance and peace of mind for customers. IMO requires the use of a PSPC certified coating for water ballast tanks and the launch, today, of a new range of pure epoxy coatings represents the latest state-of- the-art in pure epoxy technology which delivers optimized performance based on customer requirements. the option to upgrade with aluminium pigmentation and proprietary fibre reinforcement technology to enhance anti- corrosion properties and long-term durability with reduced maintenance expectations. Developed specifically with customer requirements in mind, HEMPADUR QUATTRO XO consists of a range of high-quality pure epoxy coatings to suit the different yard working methods and VOC requirements. Longer re-coat intervals are required in Korea and Europe whereas shorter intervals have been adopted in China and the Americas. Similarly, Korea and the US prefer 80% volume solids whilst China mainly works with 60–70%. For the shipowner, charterer or ship-management company, the high quality and robustness of QUATTRO XO gives peace of mind and reduced maintenance costs. In January, anticipating industry changes and responding to customer demands, Hempel announced the launch of two new pure epoxy coatings. v a two coat system which reduces expensive application times. temperatures as low as –5°C/23°F. and re-coatable after only four hours at 20°C/68°F, is substantially faster than current available tank coatings in the market. cross-link density technology on level with a phenolic epoxy coating, which gives added chemical and corrosion resistance and a hard, smooth and glossy surface for easy cleaning. HEMPADUR 15600 is also suitable for grey and black water tanks, mud and brine tanks, refrigerated seawater fish tanks and other vessel tanks. v high surface tolerance — as this is a repair product, surfaces to be painted might not be in the best of conditions. HEMPADUR EASY 47700 can be applied to a variety of surfaces. v reliability across the temperature scale — HEMPADUR EASY 47700 can be applied at temperatures as low as –10°C/50°F and up to +40°C/104°F which allows it to be used in most dry docks and at most times of the year. Commenting on the new coating,Aamodt says:“The coating requires minimal expensive surface preparation and its fast drying and recoating time means that the vessel spends less time in dock. This saves money for the owner. On top of that, its wide application and all season use both for cold and hot humid climates are why we’ve called it EASY”. Judges on the panel included ABS Director of Energy Efficiency, Jan Otto de Kat; and the Secretary General of the International Chamber of Shipping & International Shipping Federation, Peter Hinchliffe. Hempel’s HEMPAGUARD® was launched in 2013 and has shown an outstanding resistance to fouling during idle periods, significant fuel savings and is providing shipowners with trading flexibility. The coating was over five years in development and was introduced to the shipping industry against a backdrop of rising bunkering costs, tightening environmental regulations and the introduction of mandatory Ship Energy Efficiency Management Plans (SEEMP). HEMPAGUARD® is based on Hempel’s patented ActiGuard® technology. ActiGuard® integrates silicone-hydrogel and full diffusion control of biocides in a single coating. Surface retention of the biocide activates the hydrogel, which effectively holds fouling organisms at bay, cutting friction to a minimum while utilizing a minimum amount of biocide. It also has the long-term stability and mechanical properties required of a durable solution. HEMPAGUARD® shows excellent fouling resistance for up to 120 days during idle periods and fuel savings of 6% on average over a full docking interval. Hempel offers a performance satisfaction guarantee contract for vessels complying with a full HEMPAGUARD® X7 specification (one of the two products in the HEMPAGUARD® series). HEMPAGUARD® is also extremely flexible, covering all combinations of sailing routes and trading patterns. Unlike regular hull coatings that, in general, are specified according to the vessel’s speed and activity level, HEMPAGUARD® retains its effectiveness when switching between slow and fast steaming. HEMPAGUARD® releases 95% less biocide than a standard SPC (self-polishing co-polymer antifouling). Moreover, the biocide is retained on the surface, thus eliminating the need for polishing, as well as requiring only one coat compared to the two or three that are normally necessary for antifouling. The surface has the same smoothness as conventional biocide-free silicone-based fouling release coatings. Trials at sea and idle period tests over five years have demonstrated very high level of fouling prevention compared to standard SPC antifouling products. HEMPAGUARD® is available in two formulations for docking intervals of 36 and 90 months and is recommended for all ship types whose owners wish to benefit from flexible trading, fuel savings and fouling defence at any speed or during idle periods. Hempel continues to develop new products based on the ActiGuard® technology. HEMPAGUARD® X5 offers sustained fouling defence for up to 36 months for any type of vessel with any trading pattern as well as for extended idle time. guaranteed fouling resistance for up to 60 idle days. HEMPAGUARD® X7 offers up to 90 months of extremely efficient fouling defence for any type of vessel with any trading pattern as well as for extended idle time. documented performance and a long track record; and v guaranteed fouling resistance for up to 120 idle days. Hempel is a renowned coatings supplier for the decorative, protective, marine, container and yacht markets. From wind turbines and bridges to hospitals, ships, power stations and homes, Hempel’s coatings protect man-made structures from the corrosive forces of nature. Hempel owns, among other companies, Crown Paints. With a focus on R&D, advanced production techniques and professional coatings advice, Hempel works around the globe to help keep its customers’ investments safe and attractive for a long time. Two virtually identical sister ships were treated with two different coatings. The Castor, a Damen Stan Tug 1907, was treated with a well-known conventional antifouling coating. The Pollux, also a Stan Tug 1907, was treated with the new foil, Thorn-D®. Both vessels operated at low speed in the Port of Amsterdam, under the same conditions and in the same waters. More foul leads to an increase in drag and higher fuel consumption. The drag on Thorn-D has been tested at (Dutch) research institutes (TNO, Delft University of Technology and MARIN) as well as in practice on operating vessels. The general conclusion is that Thorn-D® fibres do not increase drag due to a change in the hydrodynamic flow structure. Port of Amsterdam manages, operates and develops the port. It ensures a safe, swift and environmentally responsible management of shipping traffic within its working area. The exploitation is aimed at port sites (rental and leasing), quays and water. In the entire Amsterdam port region a yearly amount of over 94 million tons of goods are being transshipped.